You know from reading how I make enchiladas, salsa, guacamole, and green rice (among other things) that I seriously love Mexican flavors. However, sometimes the multi-step approach to burritos, tacos, and other dishes that have to be “built” requires more time than I’m willing to put forth. 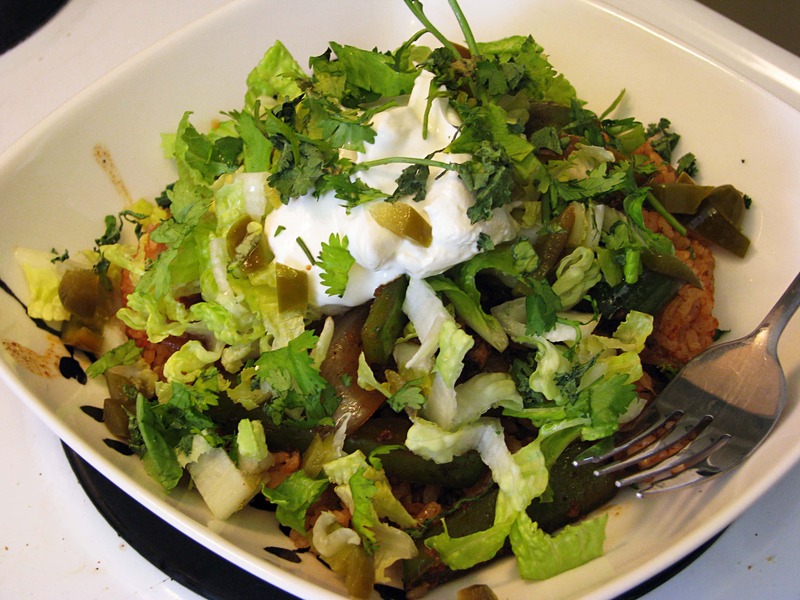 This meal can be made vegetarian or not, and can be adjusted to be as decadent (cheese, sausage, sour cream) or as healthy (no meat or sour cream, guacamole) as you’d like it to be! Trust me, you’ll love this. You could probably use a plate too, no one would know. As per the usual, this recipe isn’t one – it’s just a way to cook some crap. As such, there are no proportions because there are SO many different variations of this meal! Basically, we’re going to layer Mexican rice with whatever burrito fillings we like and top it with any toppings we feel like – that’s it! 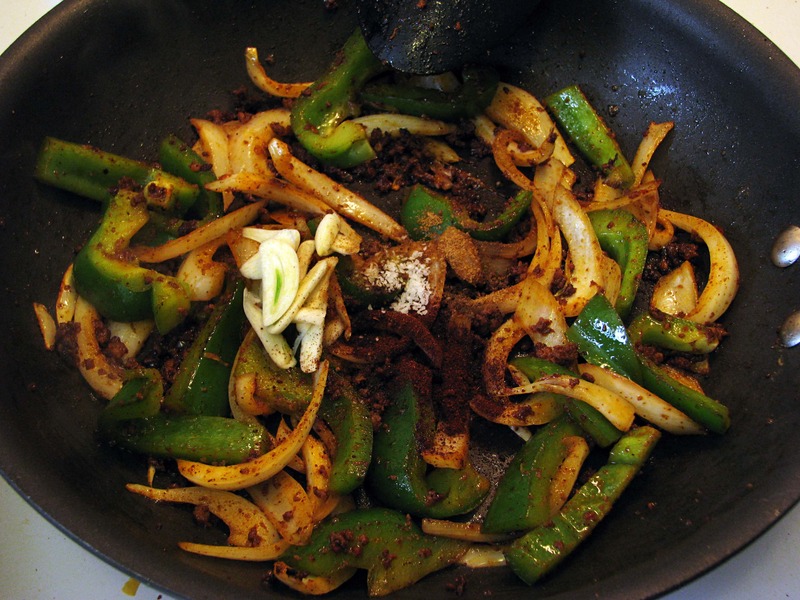 Burrito fillings – veggies, meat, chorizo, whatever! 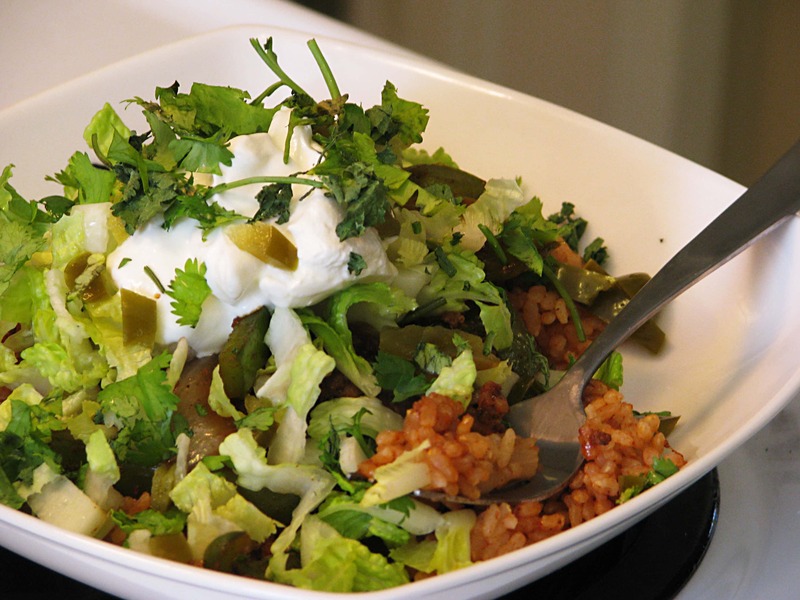 Toppings of your choice – sour cream, salsa, lettuce, jalapeno…the possibilities are endless! 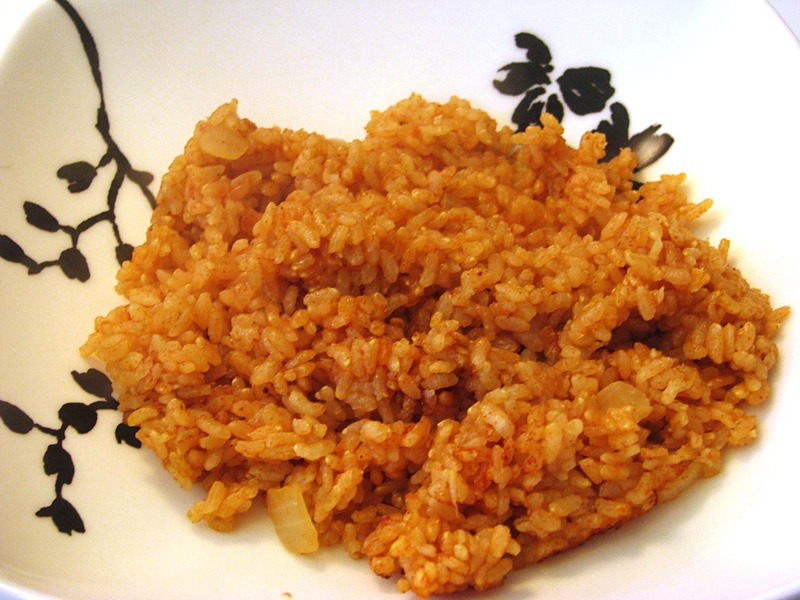 First, make some red Mexican Rice. You can use my version or whatever kind you like! Don’t use a mix though – you’d be adding unnecessary chemicals to your life that are much better if they come from boxed wine. For realsies. I like to use chorizo or vegan chorizo if I have it on hand – you can use just a little bit and it adds so much flavor to everything! 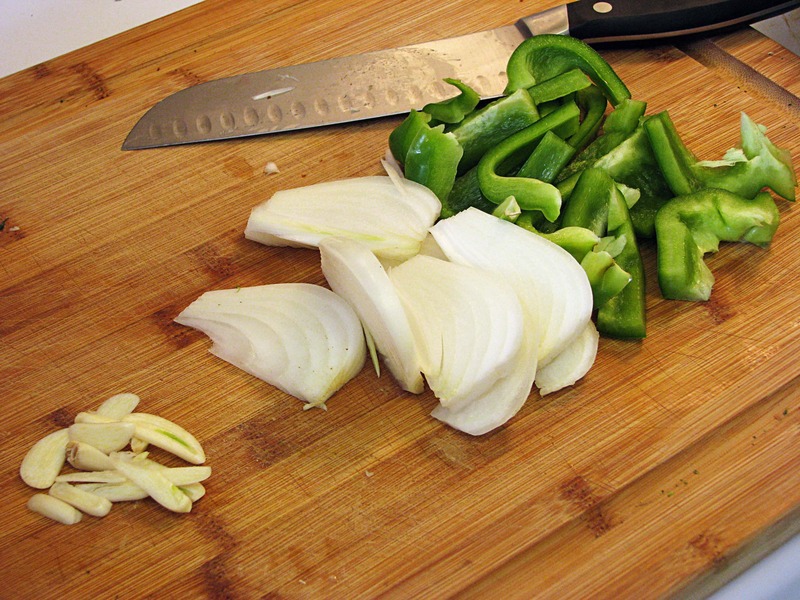 I also (for two servings) use 1/2 green pepper and onion and 2 garlic cloves. Yum! While the rice is cooking, heat a pan to medium-high and squish in the chorizo. 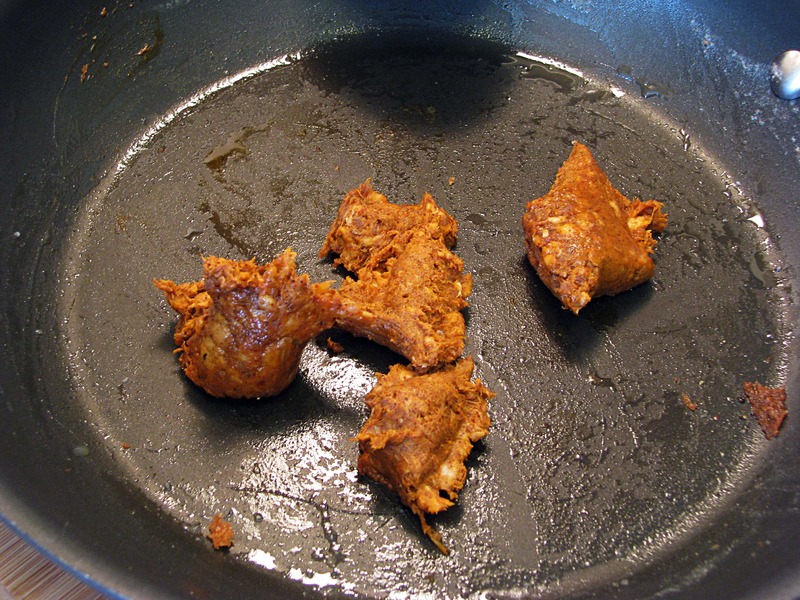 As it cooks it will break up easily; help it crumble with a spoon for about 4 minutes. While the chorizo is cooking, chop your veggies. Zucchini, mushrooms, or colored bell peppers would be great too! Add spicy peppers if you’re into that kind of thing. I am! 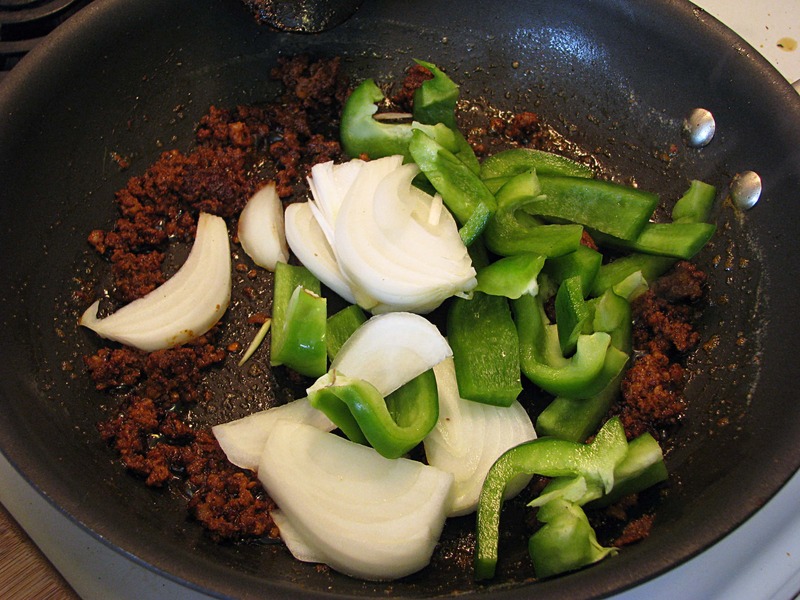 When the chorizo begins to crisp around the edges, add all the veggies EXCEPT the garlic and stir around with the chorizo for a few minutes. Now, grab your spices! 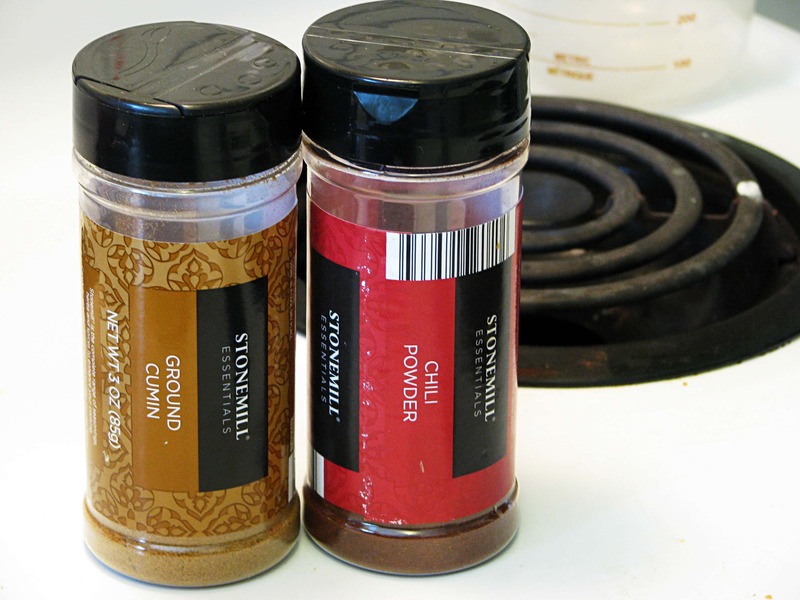 I use salt, chili powder, and cumin. That’s it! 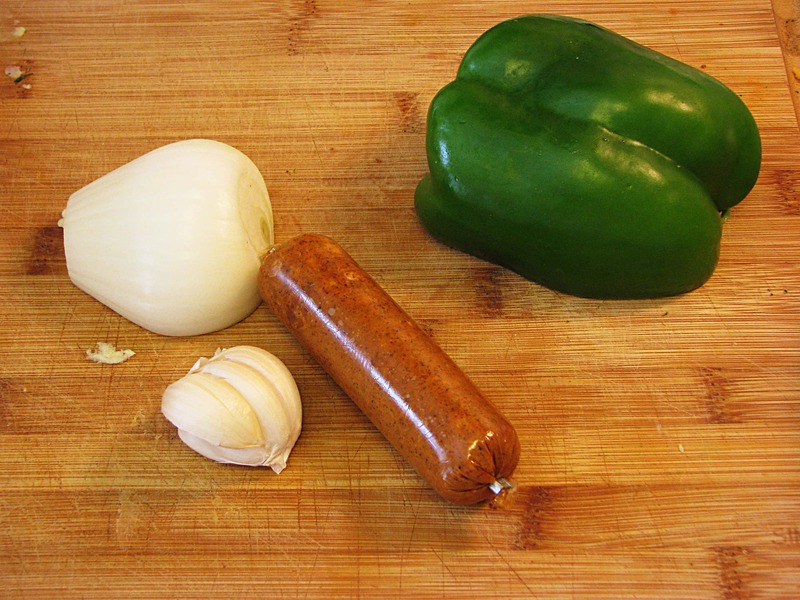 The chorizo has a great flavor, so you don’t need much more than that! If you don’t use chorizo add a sprinkle of paprika and cayenne pepper too. When the veggies have started to soften (they won’t be cooked all the way through), add the garlic, 1 teaspoon chili powder, 1/2 teaspoon cumin, and a sprinkle of salt to the veggies and chorizo. Stir this together – it will smell GREAT. 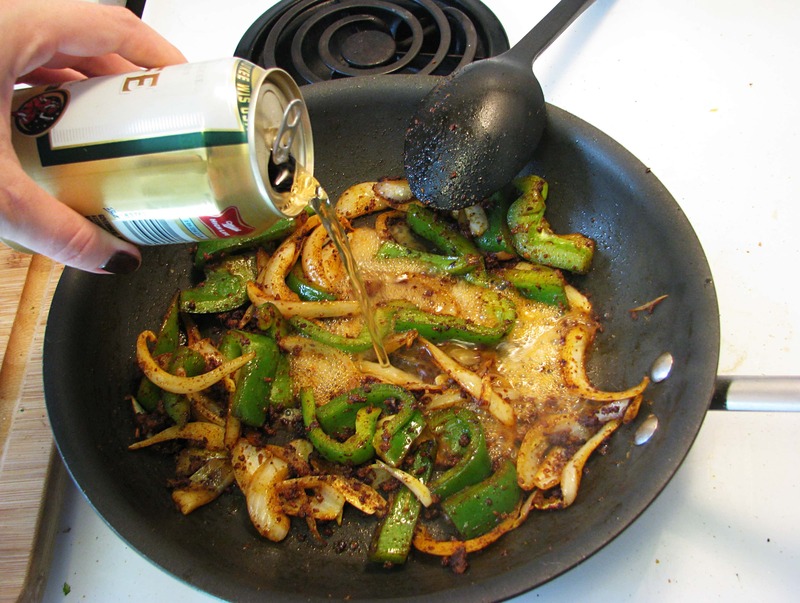 Stir the spices together for 1 or 2 minutes and NOW, for the secretspecialamazing ingredient – add a cup of beer and stir it into the veggies to make a sauce. Yep, beer! It gives a great tang and will make all the spices and chorizo drippings come together into a thin sauce. Let the beer reduce and thicken for about 2 minutes, and then the veggies are done! If you’d like more sauce add some chicken stock, water, or more beer. Then, it’s time to get our toppings ready. My toppings really change with the weather slash depending on what I have in the house. Fresh diced tomatoes, salsa, guacamole, raw onion, grated cheese….you can use whatever! 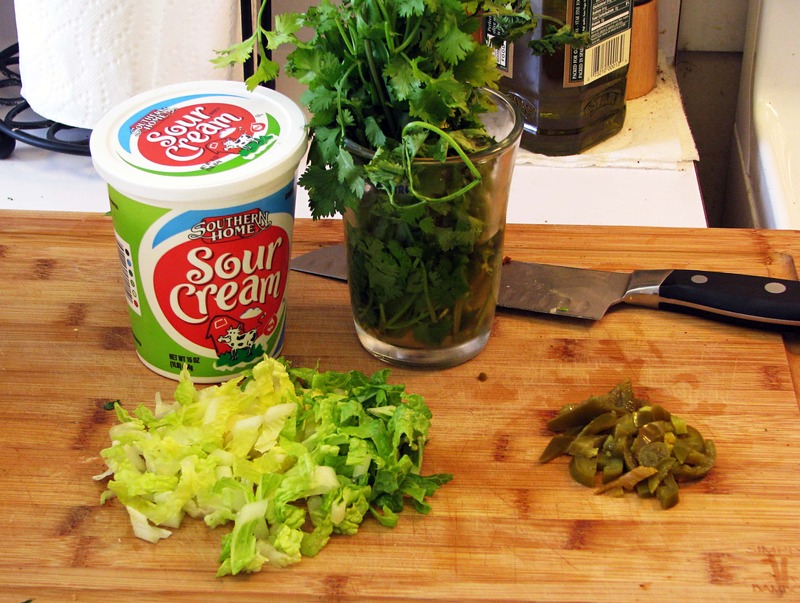 On this particular day I had sour cream, cilantro, diced pickled jalapeno, and shredded lettuce. Now, it’s time to build the bowls. 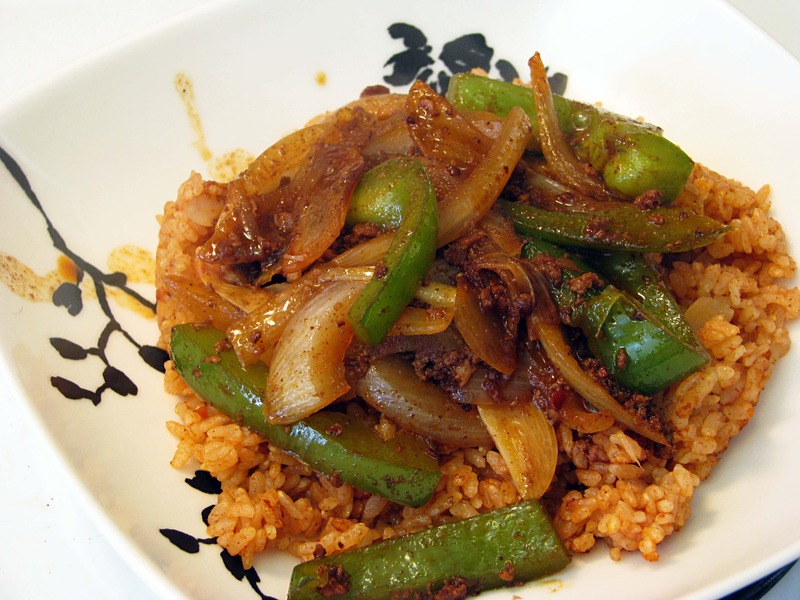 Spoon the veggies and their sauces onto the rice so everything will taste like chorizo. Then, top it with whatever you like! I go a little nuts, as you can see. Condiments are kind of my life. I feel pretty strongly about them, and I use them all the time. Enjoy this! It’s quick, easy, and can be altered to suit a variety of tastes! Those rice bowls sound yummy!